Hello everyone, it has been about 2 weeks since I last updated the blog with any pictures or information on how it's been going. 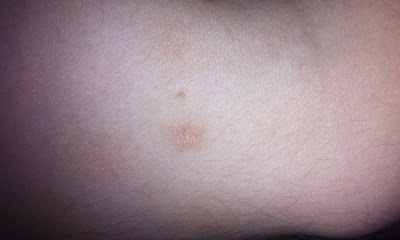 As you can see above there is still a mark where the mole used to be. It went from a bright pinky colour to a dark brownish colour but it has been fading as each day comes and to be honest I don't think anybody would notice the mark unless you pointed it out to them. I am very happy with it and I will update you again on day 28, hopefully it will be unnoticeable altogether. Thanks for the comment and feedback. I did create this blog as I couldn't find anyone else who did something similar on the internet. So this lead me to trying it on myself and letting everybody else know the truth if it actually works or not. The scar has healed around 90% but I can notice a little black mark in the centre that has appeared. Not sure whether the mole has started to reappear or if it's just healing. I read it can take 3-7 months for a scar to fully heal, it vary's from person to person. The mark is no where near the size of the mole btw. That's good that it actually worked for you as well. You just need to have the patience to actually do it everyday and wait for the results. I'm also sure the facial area heals faster than other areas on your body so hopefully you should be mole/scar free very soon. I really enjoy how you're following up with the "scar" and if it's going to maybe grow back. I thought the pictures were the best part too! Sorry about the delay, I've been really busy. Thanks for the feedback on the blog. Glad you have been finding it informative and useful to you. I hope everything has been going well with your Mole removal. Do you have any updates on your progress? Hi, I have a raised mole inbetween my eyes which is slightly pigmented (I have slightly brown skin and it's a tiny bit darker). Do you think it would be safe to try and remove this mole with this method as it has really been bugging me for the past few years. Do you think that it would work if I applied the ACV with a cotton bud then washed it off after 30 minutes or so as putting plasters over it would be very tricky. Thanks, and awesome blog by the way, the best I have seen. If you think the mole is suspicious looking and you feel uneasy removing it just in case it is cancerous, then I would suggest getting it checked by a qualified doctor or skin specialist. It's better to be safe than sorry. Once you've did that and know it's safe to be removed I'd use the ACV method. I'm pretty confident that it would still work on the mole by just applying it for 30 minutes at a time. It would just take longer to successfully remove it I think. Thanks, I will give it ago, I visited the doctor about it the other day and they said as I had had it from birth and that it was a regular shape it was not cancerous (sorry forgot to mention that). Thanks for the blog and I will give it a go and post back after. That's weird. I remved a mole on my face and it looked nothing like that. One piece of advice I would give people is to use as small of a bandage that you can get away with, seeing that so any peoples skin are irritated by the glue or latex. It took me three days of treatment with the vinegar, it scabbed, after it was softened with the vinegar on the third day as I was rubbing more vinegar on the mole basically just rubbed off and I quit the process and let it heal. Moles can affect the way we interact with different people. This post will help those who wanted to get rid of their moles. Make sure you get Bragg Organic apple cider vinegar with "the mother" in it. I removed 4 half eraser sized moles off of my face (took about 2 weeks total) and now I am working on an annoying slightly larger than eraser size mole on my mid-thigh. Had that one since birth and it always drove me nuts. It is the 3rd day and it is really starting to work well. Good luck everyone. Be careful and patient. You should, as others say, consult your physician before you attempt this. Hi. I removed a mole using acv & once the scab fell i had a fleshy crater. What should I do to improve Its appearance? How long will it take? Your skin should return to it's flat appearance very soon. Just keep the area covered and leave it too run it's course and heal up. Once your skin has returned to being smooth and flat then apply something such as bio oil to help with any scarring or dark areas that may have formed. The area of skin I did my mole removal on is almost completely faded now. I think it has been about 8 months since I did it although I never used any scarring creams etc otherwise it will have probably healed fully. I wish you all the best with the healing process. Hi! I came across your blog a few weeks ago while looking for a way to remove some moles on my face and I am quite impressed with the results you get with ACV. Just to clarify, i had an itchy mole on my back, went to dr, saw nurse who assured me was a seb k, (not a mole, but a bit the same, common in people over 40) anyway, the itching and tingling was annoying me, so gave the acv a try, burned a bit, after 6 days, dropped off, left a raw red patch that healed, but left a brown mark, (from the burn from the acv) any way, the itching is actually kind of ok now, (one month on) but the tingling is still there a bit. Juat wondering if this is . Thanks. Has your scar disappeared yet? I also removed a mole and it left a very bright red mark. It hasn't improved in a appearance at all after a couple of months, and I'm worried that it might be permanent. Hi, I would like to know what you think about my mole removal. After 4 or 5 days, there was a scab that I picked off and now there is a little crater, but I do not know if the mole is completely removed to the roots. I'm asking because I don't know if i should stop or keep going and the mole is on the back of my neck where I can't get a good look at it. I'm thinking that since there is a little crater, then it's probably gone. Is that what you experienced? Although I'm not a dermatologist or doctor, from experience of doing it myself and from looking at the pictures it looks like you have gotten all of the mole to the root. What to do now is cover it with a plaster/band aid and leave it for a couple of days and the crater well gradually fill up until it is level with your skin. As soon as you see this happening apply some bio oil or something similar to the area for the next few weeks to the next few months in case you are left with a scar. The mole that I removed in the pictures left a tiny red scar but it's a hell of alot better than the mole that was there before. I applied APV to my mole about 3 nights ago, and have applie dit for a few hours for the follwing nights as well, teh mole is now black and scabby and has been for 2 days however it shows no signs of falling off, is this normal? Yes this is normal and it should fall off very soon. If I remember correctly my mole fell off in the shower, well most of it anyway. Just keep doing what you've been doing and it should fall off in a few more days. Please don't pick at it though as you may increase the chances of leaving a scar. Did the mole ever return? No the mole never returned but I was left with a little scar. I think the reason for this was that I never protected the skin well enough whilst carrying out the experiment. Do acv works on flat mole ? I'm not sure if it works on flat moles as I only ever carried out the experiment with the AVC on the mole I covered in this blog. I have heard of people using iodine on flat moles and I've seen before and after pictures. It appears to work pretty well in most cases. I'm unclear about what it looks like when the mole "scabs up" which it sounds like you're supposed to stop ACV treatment. It really works for me as well, I tried on my 2 birth moles on my neck and shoulder. It is really wonderful, the moles are peer off after 8 days. nice, these are some interesting tips for home remedies. Hello your blog is sharing great information. Thanks for share this blog, coolangatta medical centre providing best Skin Cancer Clinic in Australia.